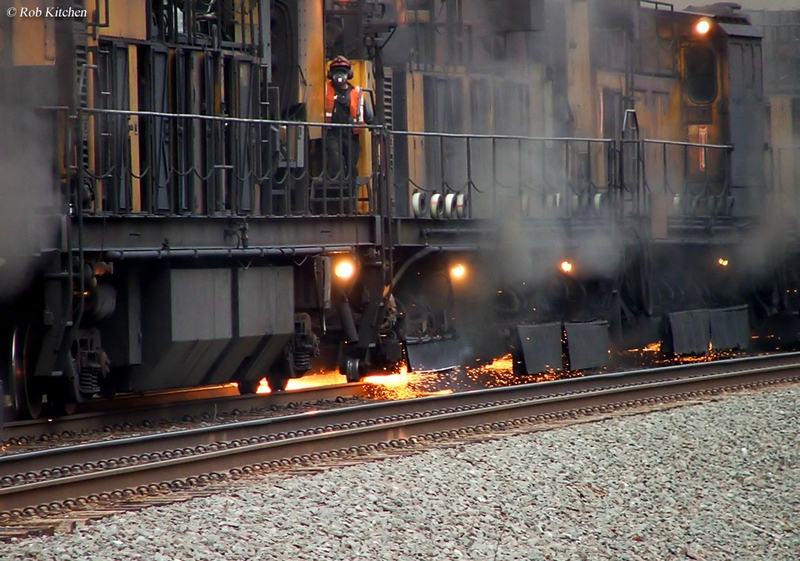 Rail grinders have become an increasingly important aspect of railroad maintenance in recent years. The machines greatly help railroads reduce their maintenance costs by extending not only the life of the rail but also other components that make up the track structure such as spikes/anchors, ties, and even the ballast itself. If you are ever able to witness a rail grinder in action, particularly at night, they put on quite a display and are loud enough, even from a distance, to sound like a small earthquake has hit the area. Virtually all heavy, main line grinding work done in the United States is contracted out by the Class I railroads. The current leader in this field is Loram Maintenance of Way, Inc. (depicted within the pictures on this page) which has been performing grinding work for railroads since it was founded in 1954. However, as you will read about below other companies have since entered the market. 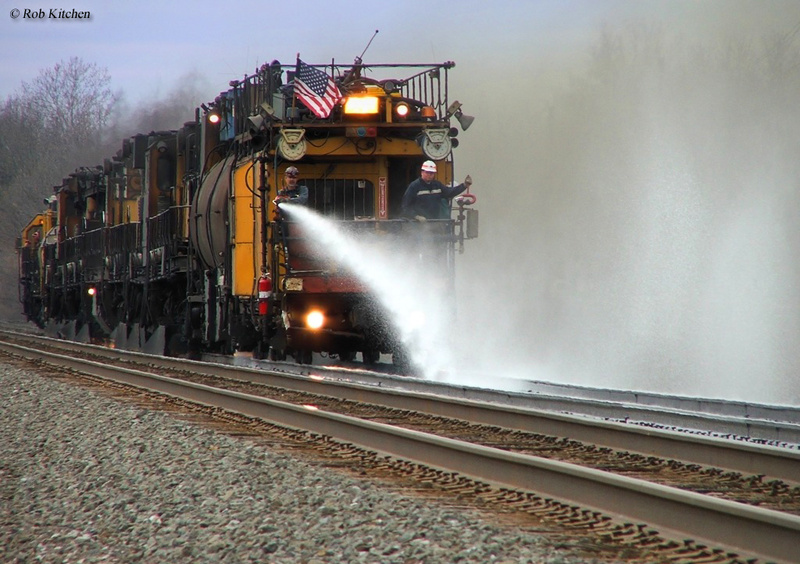 Rail grinders have been maintaining railroads for only the last few decades but their importance has grown tremendously as railroads have come to realize the savings in maintenance they provide. While the operation of a rail grinder is loud and spectacular the work it is performing is actually rather straightforward, profiling the top of the rail to provide maximum efficiency for both trains and the track structure. While it may not look it, trains and any other heavy vehicle operating on the rails causes a considerable amount of wear to them. Over time with the beating rails receive by coming in contact with steel wheels they are ground away and distorted (causing damage to both). For rails this damage is intensified in curves where the outside rail receives much greater wear because of the centrifugal forces applied to it as a train passes over (in other words, more of the train's weight is applied to the outside rail). Because of this the rail head on the outside rail is worn away much more quickly than the inside rail. If left unchecked, as both tangent and curved wear with every passing train and become more worn and distorted (one problem of which is that the track will lose its proper gauge), derailments will occur leaving to even greater problems. Rail grinders work by using a circular grinding stone, that are situated underneath the equipment right above the rails. These stones wear out extremely quickly and usually only last a few hours before needing replaced. As you might have guessed because of this a grinder will go through dozens and dozens of these stones (sometimes into the hundreds) in a single day. There is however, usually a method to the madness. Rail grinders will typically use a coarser stone to work out all of the dips and wear found along the rail head and a finer stone to finish the work and return the rail to a nice, polished finish. 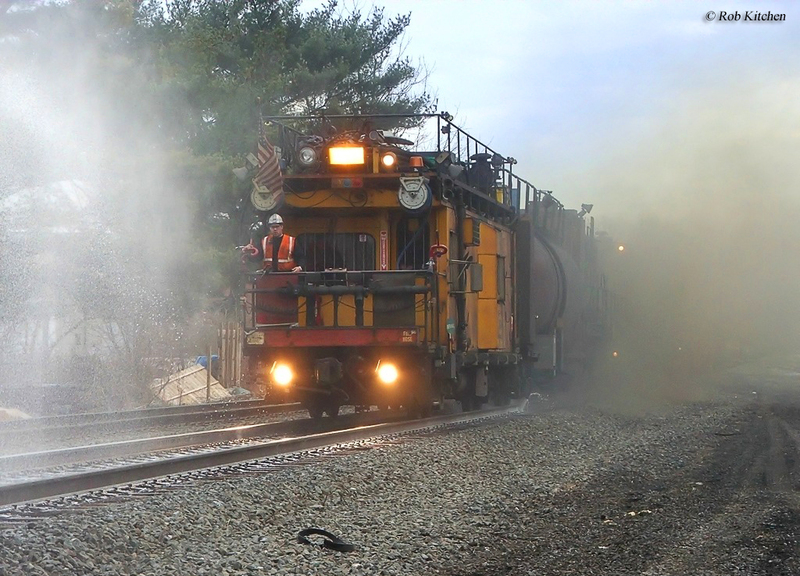 A typical rail grinder doing work along a heavy, freight main line in the United States is not a singular unit but an entire train staffed with several workers. It includes the lead locomotive, which pulls the grinding equipment and crew quarters. A typical grinder is stocked with enough tools, equipment, and amenities for the crew to be out on the open main line for days at a time. For freight railroads in this country almost all rail grinding work is contracted out to a company which specializes in the field such as Loram, Speno, Pandrol Jackson, and Harsco Track Technologies. However, some railroads have purchased small grinding units to do light work to save the costs involved in contracting and most light-rail/commuter lines which do not see freight traffic always use these singular units as their rails simply don't take the heavy beating like freight lines do. According to Brian Solomon's book Railway Maintenance more than twenty years ago the estimated cost of grinding operations cost railroads between $15,000 to $30,000 per day. As such, you can imagine that this price tag has jumped considerably higher today liking costing an additional 50% or more. As mentioned above Loram generally receives the bulk of the contracts concerning heavy grinding and their unique maintenance trains have become a common sight on Class I main lines not to mention a favorite photography subject for those interested in railroads and their operations. However, Loram also specializes in other areas of MOW work such as undercutting, ballast cleaning, and general ditching. To learn more about their services please check out the company's website.